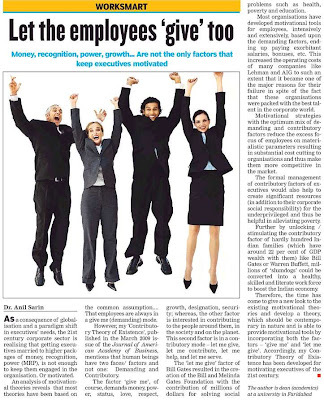 I came across this article in today's Hindustan Times that indicates that letting employees fulfill their Individual Social Responsibility (ISR) could be a potent tool for motivating them. Dr. Anil Sarin, an academic, calls this the Contributory Theory of Existence. Dr. Anil Sarin's Contributory Theory of Existence is mind blowing and world changing idea.Dr. Sarin got developed innovatory relationship between the corporate sector and the eradication of poverty.Great achievement. Dr.Anil Sarin's Contributory Theory of Existence is new concept.Government should utilise the talent of bright academicians/professionals like Dr.A.Sarin for the growth of Indian economy & eradication of poverty. The article written by Dr. A Sarin should be forwarded to all the CEO's for its implementation in their organizations in the interest of corporate sector and society.